We started Day 3 with another excellent Hyatt breakfast buffet. Mary Ann and I repeated our traditional “make our lunch at breakfast” routine. I made another sliced meat and cheese sandwich. Mary Ann grabbed a yogurt and we both took some fruit. I bought a jar of mustard this morning at a local ABC Store, that (to me) enhanced my sandwich. 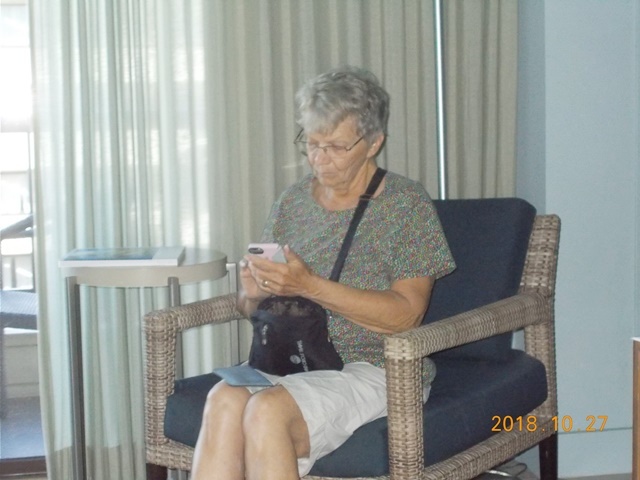 This is our room/view and Mary Ann sending messages to our family back home. Today we went on a bus tour around the north shore of O’ahu. 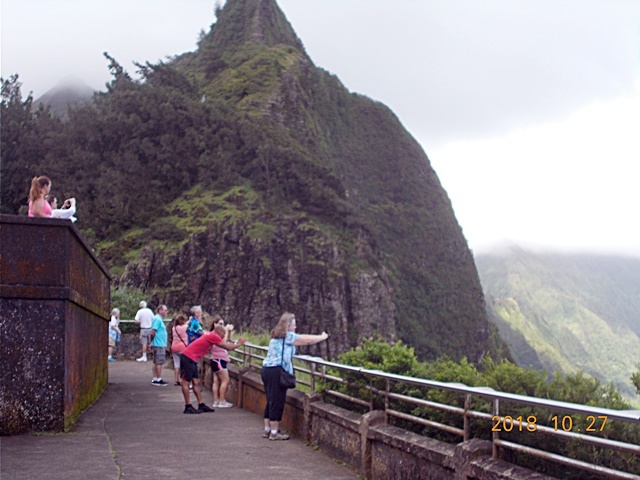 Our first stop was at the Nuʻuanu Pali. 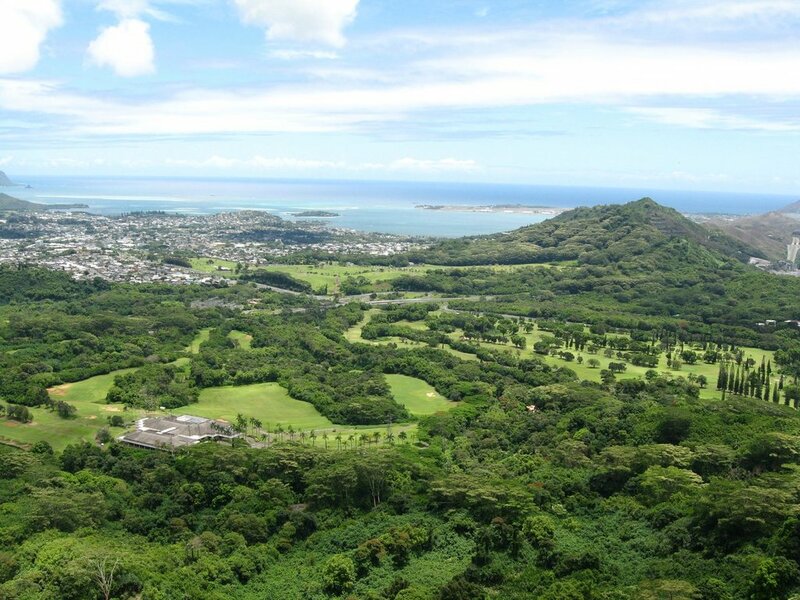 This has been a vital pass from ancient times to the present because it is a low, traversable section of the Koʻolau mountain range that connects the leeward side of the mountains, Honolulu to the windward (west) side Kāneʻohe. The route drew settlers who formed villages in the area and populated Nuʻuanu Valley for a thousand years. The Nuʻuanu Pali was the site of the Battle of Nuʻuanu, one of the bloodiest battles in Hawaiian history, in which Kamehameha I conquered the island of Oʻahu, bringing it under his rule. In 1795 Kamehameha I sailed from his home island of Hawaiʻi with an army of 10,000 warriors, including a handful of non-Hawaiian foreigners. After conquering the islands of Maui and Molokaʻi, he moved on to Oʻahu. 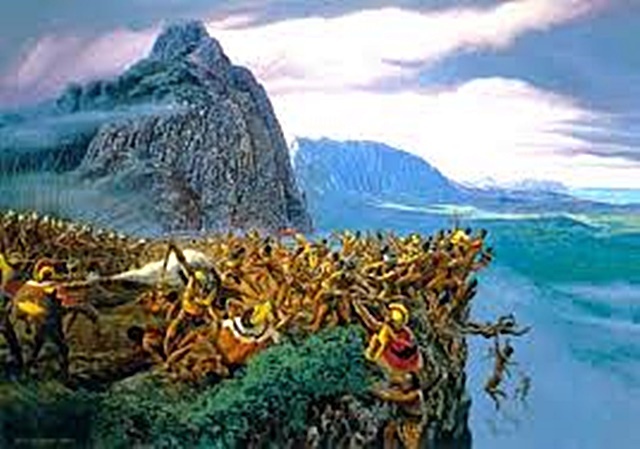 The pivotal battle for the island occurred in Nuʻuanu Valley, where the defenders of Oʻahu, led by Kalanikūpule, were driven back up into the valley where they were trapped above the cliff. Kamehamehaʻs warriors forced Maui Chief Kalanikupule’s men to their deaths off of the cliff. Roughly 400 warriors died in this battle. After this battle, the Kapanui (Hawaiian Warriors) recited a Hawaiian chant as a sign of respect to those who have died there. This is the last thing Kalanikupule’s men saw (minus the 20th century golf course, etc.) before falling to their deaths. It is the Nuʻuanu Valley on the eastern side of the Ko’olau Mountains. Off the shore is a large island which is the home of the Kaneohe Marine Corps Base. 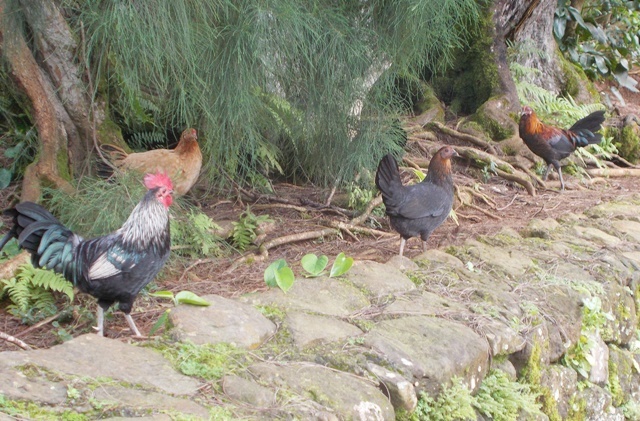 These are a few the ever present Hawaiian wild chickens. They are everywhere and on all the islands. No one seems to pay much attention to them. They live in fields and lawns and get along nicely in the human environment. Nobody captures and eats them – they are “too tough and stringy”. There have no natural predators (except maybe feral cats – which I’ll discuss later). Note the colorful rooster on the left. Also note his spurs. A good reason to not get too close. 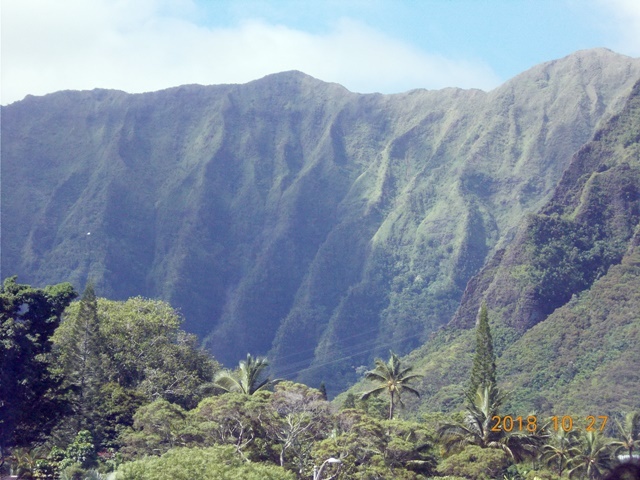 This is the eastern side of the Ko’olau Mountains We drove along views like this along the coastal road. 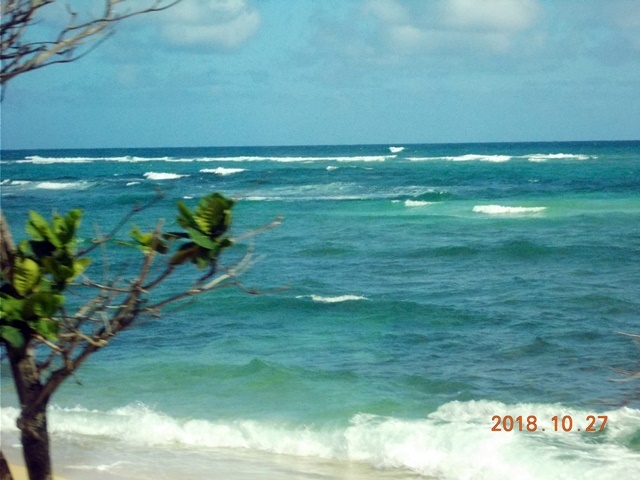 Much of the this, and the other island’s we visited, had mountainous terrain that looked similar: deeply cut ravines and jagged ridges! Pretty rugged, eh? This is Joseph Kekuku the Hawaiian man from Laie (a local town) who originated what the world now knows as the shaka sign. We stopped for lunch at this Polynesian Cultural Center. Out came our breakfast built lunch and our water bottles! 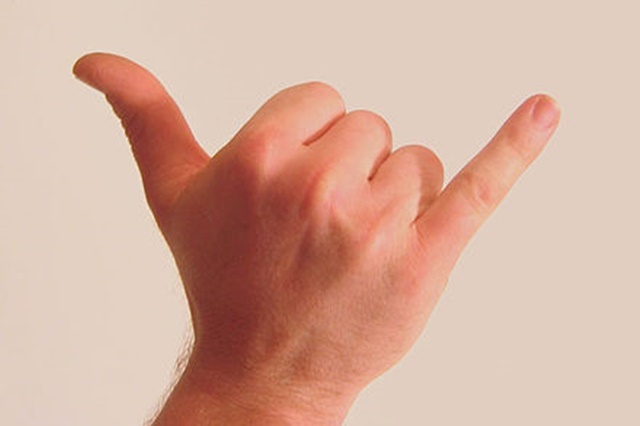 This is the Shaka sign. 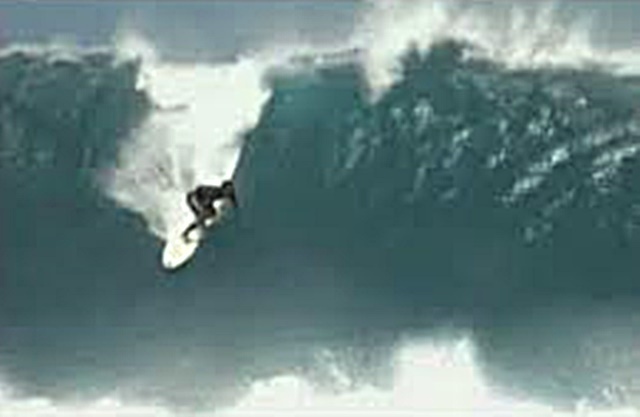 Sometimes known as “hang loose,” it is a gesture of friendly intent often associated with Hawaii and surf culture. 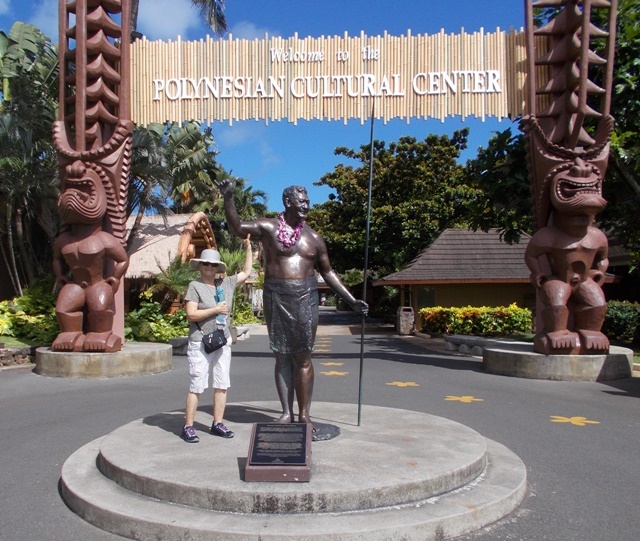 The Polynesian Cultural Center (PCC) is a Polynesian-themed theme park and living museum located in La’ie, on the northern shore of Oahu, Hawaii. Owned by The Church of Jesus Christ of Latter-day Saints (LDS Church aka Mormons). 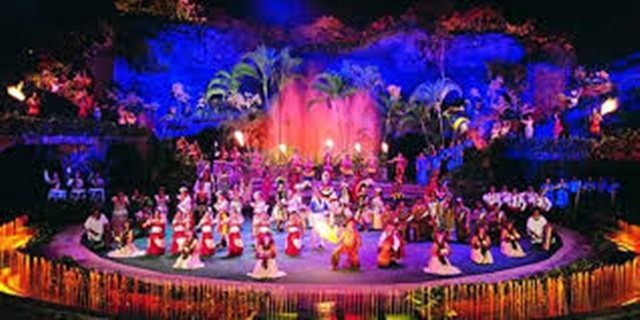 The Polynesian Cultural Center is most known for its evening show: Ha-Breath of Life. After dinner (a Luau), visitors gathered to watch a mix of fire dancers, lively battles and Polynesian story telling. Seventy percent of the Polynesian Cultural Center’s approximately 1,300 employees are students at BYU-Hawaii. Although it is largely a commercial venture, PCC profits fund various scholarship programs at BYU–Hawaii. Students may work up to 20 hours per week during school terms and 40 hours during breaks. The La’ie Hawaii Temple (next door to the PCC) is a temple of The Church of Jesus Christ of Latter-day Saints (LDS Church). 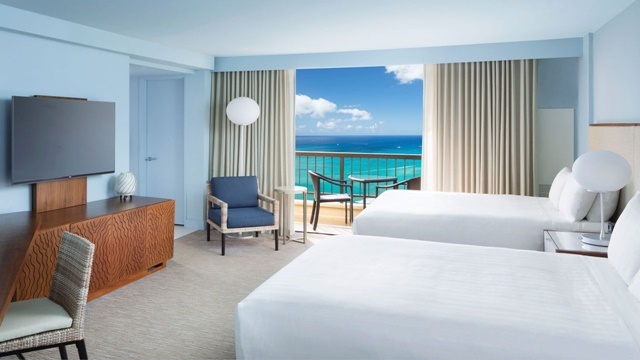 It is located on the northeast shore of the Hawaiian island of Oʻahu. The temple sits on a small hill, a half-mile from the Pacific Ocean, in the town of Lāʻie, 35 miles (56 km) from Honolulu. 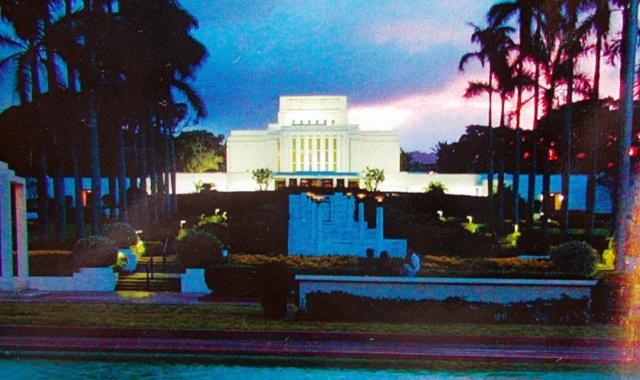 Along with Brigham Young University–Hawaii and the Polynesian Cultural Center, the La’ie Hawaii Temple plays an important role in the town of Lā’ie, with the Visitors’ Center attracting more than 100,000 people annually. The temple site was dedicated by Joseph F. Smith on June 1, 1915. He is remembered as the founder of the Mormons. 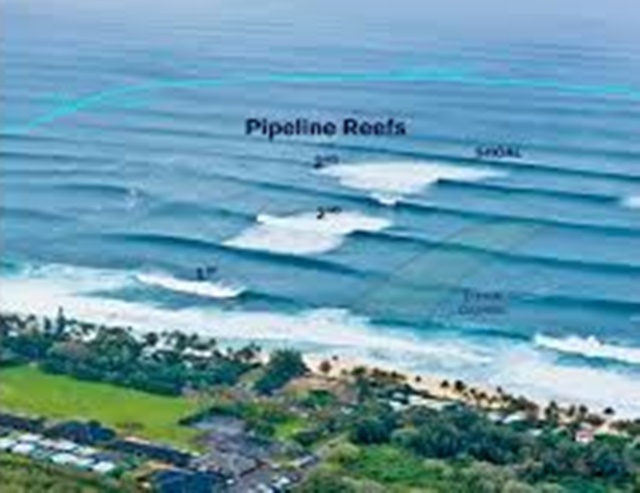 This is what the Pipeline looks like on a good day! We stopped at the town of Haleiwa. for a break. 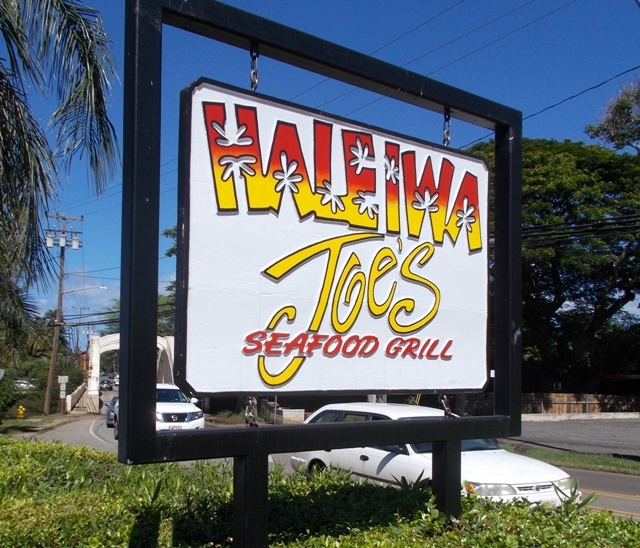 I trotted back to Haleiwa Joe’s to see if Steven, the son of our good fiends (Alan and Pat Estabrook) from Cape Cod, was there. He had a serious biking accident and was not yet back to work. I left a phone “Greeting” for him and the tour bus had to move on. Our next stop was on the road to Wahaiawa at the Dole Plantation. Originally operated as a fruit stand beginning in 1950, It was opened to the public as Hawaii’s “Pineapple Experience” in 1989. 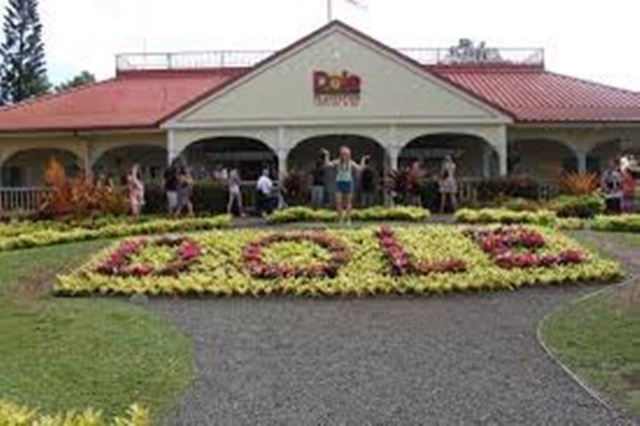 Today, Dole Plantation is one of Oahu’s most popular visitor attractions and welcomes more than one million visitors a year. Our bus parked near a grove of Eucalyptus trees. In some ways this was more interesting than the pineapples. 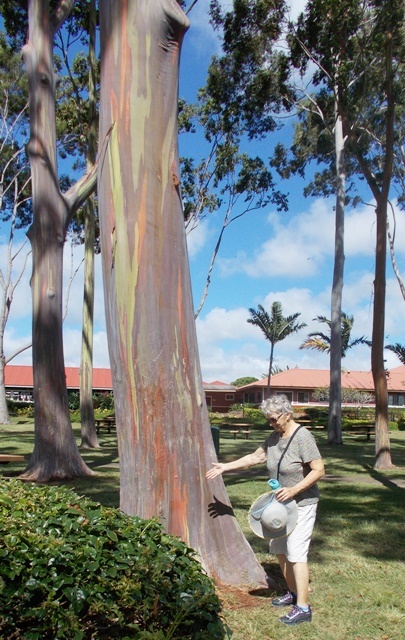 Note the colored bark! Where were the koala bears? Here’s a pineapple plant. It’s only a couple of feet tall! 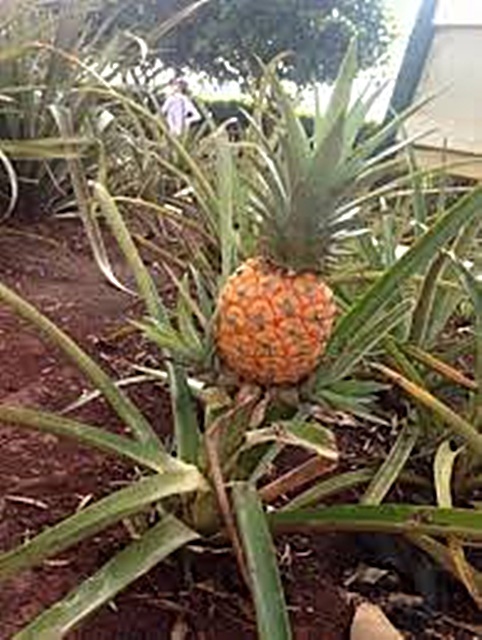 The Hawaiians no longer grow pineapples for export. Apparently, they are cheaper to get from Costa Rica. All the islands grown pineapples are for islands consumption. I must have consumed 10 pounds in our 10 days. They were super sweet and juicy. 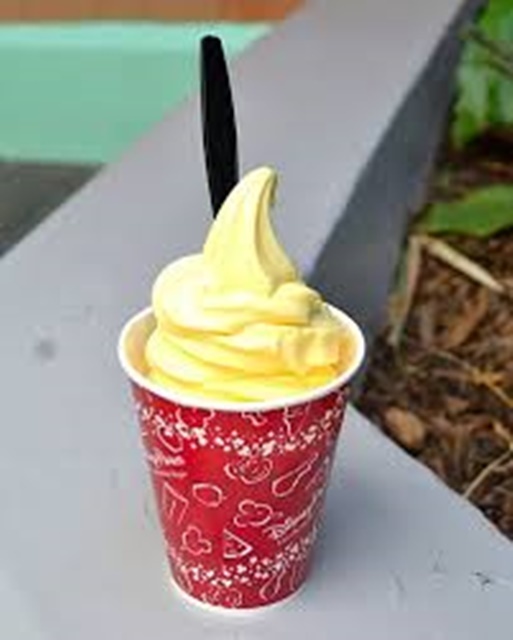 One featured item at the Plantation was Dole Whip. It’s like pineapple Dairy Queen. Ya gotta have one! It’s delicious!! We finally packed our bags for the short flight tomorrow AM to Kaua’i and hit the hay for a good night’s sleep.